App for Dropbox lets you access Dropbox super fast. Browse, download and upload files without even opening your browser or finder. 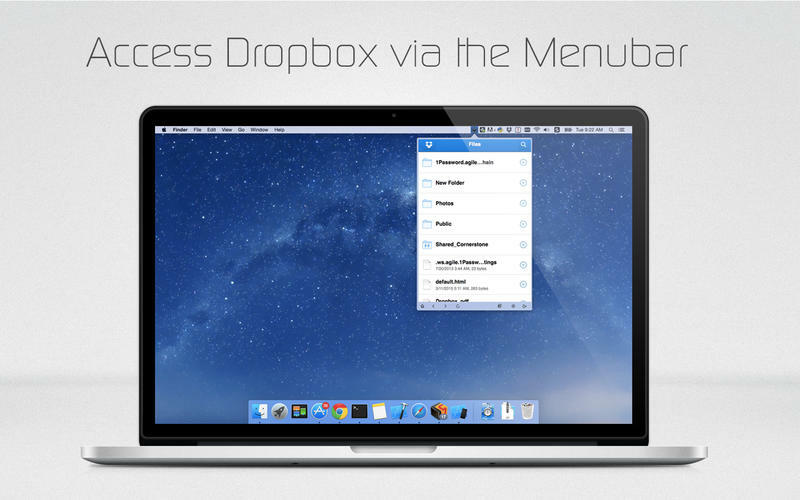 Just click the App for Dropbox icon in your menu bar and sign it with your Dropbox account, its that simple. You can also switch to the stand alone desktop mode for full window experience (requires Pro). To upload files you need to be in window mode. • Control opacity of experience and only fully show the app when your mouse is in the panel. • Get to your photos, docs, and videos from your Mac. • Save photos and videos to your Dropbox. • Share your photos and docs with family and friends. • Share a link to even your biggest file — no more attachments. • Everything in Dropbox is backed up, safe, and secure.